Last year I made New Year’s Food Resolutions. So, how did I do? I said I was finally going to go to Oleana so I could stop calling my favorite restaurant I’d never been to. Check. It took me until September, but I did it, and it was every bit (every bite?) as awesome as I had hoped it would be. 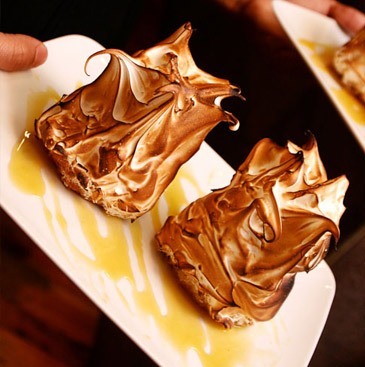 Everything we got was fantastic, but the show stopper was definitely the baked Alaska that came to the table as a towering mound of spiky browned meringue surrounding coconut ice cream and drizzled with passion fruit caramel. I said I was going to experiment more with Asian food. Hmm, I’d say I achieved maybe 30% of this goal. On the one hand, I got over my fear of dumplings and realized that they are marginally time consuming, but not technically difficult to make. On the other hand, that’s about as far as I branched out in terms of Asian food and I firmly believe that there’s more to Asian food than stir fry (as tasty as stir fry is). So, some success, but not a slam dunk. I shall keep exploring Asian cuisine on my docket for 2013. On the other hand, I did explore Indian cuisine more – a lot of the time our vegetarian meal of the week is Indian themed since they do a lot of nice (non-tofu based) vegetarian dishes. Partially as a result, I got really good at making naan at home – it poofs when you griddle it and everything. I’ve made it plain, stuffed with cauliflower, and stuffed with chopped nuts & raisins. Someday I want to do a leftovers version that is stuffed with leftover curry. India’s vaguely Asian-ish isn’t it? Can I up my success rate on experimenting with Asian food to a 50%? I said I was going to be more adventurous about ordering fish in restaurants. It was a resolution I tried to adhere to, but mostly failed to accomplish. But! this was not entirely my fault. I don’t actually go to many seafood restaurants of the three people I regularly go out to dinner with one of them doesn’t love fish, one of them is allergic to fish, and I don’t actually know the fish-stance of the third person, I think she’s ambivalent (unless it’s lobster in which case she’s very pro). As a result, however, seafood restaurants never make the top of our list of places to try, and most other restaurants tend to serve salmon and/or white fish as their seafood option and I know I don’t like salmon and that I do like white fish. I did start making fish more often at home, but really I only ever buy a variation on cod or haddock with the occasional daring foray into tilapia. But again, this is mostly because that’s what available to me as day caught fish, and what’s affordable. To make up for my lack of experimentation with fish, I did get more adventurous about what I order in restaurants in general. Rather than just sticking to my tried and true formula of either ordering the lamb or the duck (or whichever one comes with a fruit sauce if both are on offer), I pushed myself to order more creatively. To that end, for Christmas Dinner I had the roe deer carpaccio drizzled with honey rosemary dressing (it was delicious), followed by a warm lightly smoked haddock served over crushed potatoes with a quail egg balanced on top (it was beautiful and tasty). This is a resolution I enjoyed, and shall keep for next year. So, let’s call this 75% success because the lack of fish variety in my ordering habits isn’t really under my control, and on the rare opportunities I did have for adventures with fish I seized them (the opportunities, not the fish – that would just be messy). There were also a number of things I said I was going to make, like milk braised pork (hasn’t happened yet – still in my floating file of things I want to try); tea smoked ribs (ditto the above); red beans & rice (made last year for Mardi Gras, and I anticipate a repeat this year because it was incredibly tasty); and duck in general (sort of yes, I make it periodically for my roommate and I for a special occasion, but mostly because its expensive not because I’m daunted by it anymore). So, that’d be a 50% success rate. Finally I cautiously suggested that 2012 might be the year I got over my fear of yeast. Not so much. But, 2013 is looking promising. Really. I have gotten more confident about my (single rise) yeast doughs – see above about mastering naan. I have kind of learned to tell when a dough is moist enough, and when it has reached the right stage of elasticity. Also, I have this shiny shiny stand mixer that’s just begging to have complicated doughs made in it. I don’t want to let it down. To that end, I have a (probably) overly complicated recipe for a traditional Greek/Turkish bread called simit (apparently kind of like a bagel, but crustier and thinner) that is cued up for sometime in the next few weeks. It involves a double rise, and shaping, and also dunking in a grape must molasses called pekmez that I want to see if I can track down before I attempt to make simit because apparently you can substitute regular molasses, but pekmez has a really distinctive flavor that is part of what makes simit, simit. Overall, I average about a 55% success rate. Not great, but at least better than half? Stay tuned next week for the 2013 food resolutions. We’ll see if I can do better this year. I think this would also be really good with sweet potatoes, and you could add a little grated parmesan to the mix. Served with a salad and a poached egg, that would be a really nice light dinner. Then again I think anything with sweet potatoes is a good idea, so your mileage may vary on this opinion. Bring a large pot of water to boil. Add the stemmed kale and cook for 5 minutes, or until the kale is tender. Remove the kale with a slotted spoon and shock in cold water to stop the cooking. Drain well (I used a salad spinner), and chop. Return the water to the boil (adding a little more if necessary) and cook the potatoes until tender, about 10-15 minutes. Drain well and roughly mash. Meanwhile, sauté the onion, garlic and sage in the olive oil and butter until the onion is slightly caramelized, about 15 minutes. Add the kale, ½ tsp salt, and toss to coat the kale in the seasonings. Mix the onion/kale mixture with the mashed potatoes, the remaining ¼ tsp salt, the pepper, and the scallions. 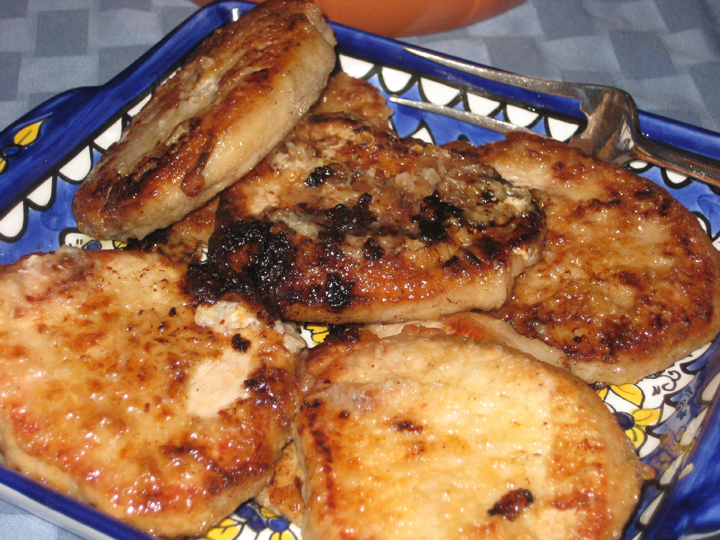 Scoop out heaping ¼ cupfuls of the mixture and shape into patties about ½” thick (makes about 12). Place on a greased baking sheet, brush the tops with a little olive oil, and bake for 20-25 minutes, turning once, or until heated through and browned on both sides. The patties can be made a day in advance and refrigerated – just allow them to come to room temperature(ish) before you bake them (i.e. let them sit on the counter for 45 minutes or so while you get on with the rest of dinner). Set a large heavy saucepan or Dutch oven over medium heat and heat the butter until it melts. When the foaming subsides, add the rest of the ingredients and cook over low heat until warmed through, then put the lid on and pop it into the oven for 1 ½ hours. 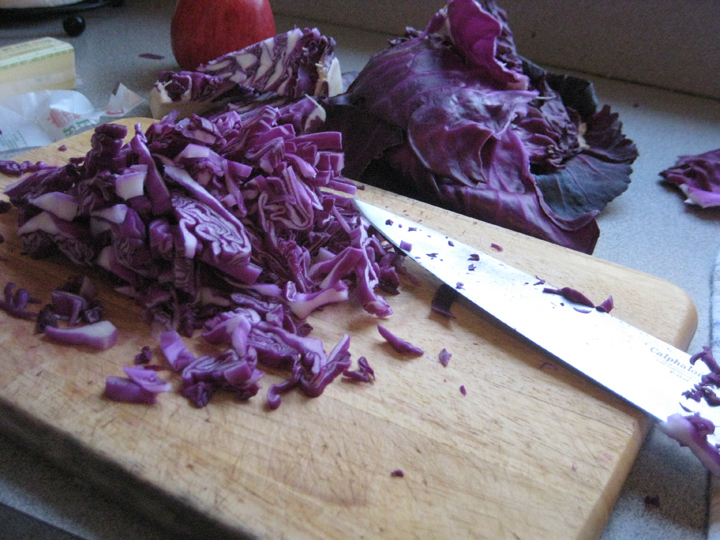 The cabbage will be tender and the liquid reduced. Return the pan to the stove top, Adjust seasonings to taste and simmer until liquid has reached your desired consistency. Serve immediately or cool and refrigerate until you’re ready for it – it’s actually better after a day or two in the fridge; Reheat on the stove top at a low simmer, adding more liquid as needed – I ended up adding another splash of red wine and some red wine vinegar for additional acidity. * If you didn’t feel like opening a bottle of wine for a ¼ cup, you could probably use chicken stock or just extra apple juice/cider – although you might need to add some lemon juice or more vinegar to cut the sweetness. Alternatively, this is a good excuse to open a bottle of wine and then have it with dinner. I feel like I need a new tag for recipes – will make people who don’t like ____ eat all of their ‘no thank you portion’, and sometimes go back for seconds. Roughly chop ¼ cup of the pistachios and reserve. 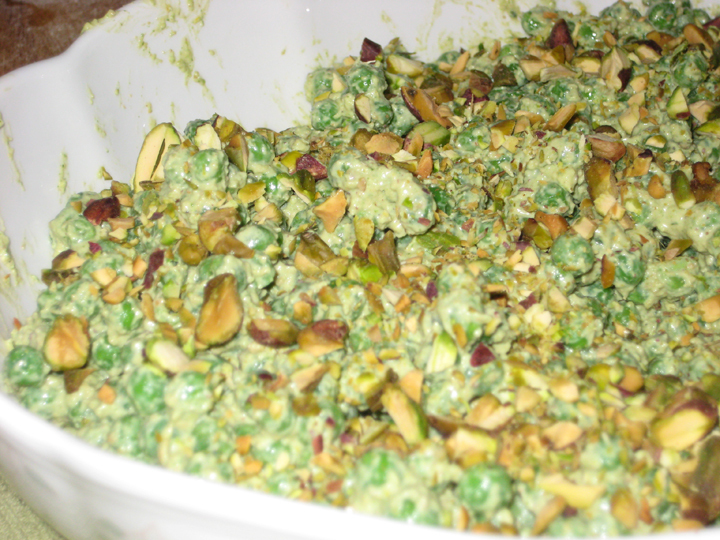 In a blender puree the tarragon, scallions, olive oil, yogurt, ¼ cup of the pistachios, and lemon zest. Season with salt/pepper/lemon juice to taste. Mix the sauce with the defrosted peas and pour into a casserole pan. Top with the chopped pistachios. Bake for 15-20 minutes, until the peas are heated through and the top has begun to brown. Serve immediately.